American prima donna; fourth daughter of Moritz Eichberg, cantor in Stuttgart; born in that city March 7, 1847. After finishing the course of instruction at the Stuttgart Conservatorium, Julie joined her sister, Mrs. Weiller, in Baltimore, in 1864, and two years later she was married to Jacob Rosewald, violinist and conductor. She returned to Europe in 1870, and continued her vocal studies under Marongelli, Mara, and Viardot-Garcia. Her career as prima donna began, in 1875, with the Kellogg Opera Company. Going to Europe a second time, in 1877, she filled engagements at Nuremberg, Mayence, Stuttgart, Cologne, Amsterdam, Berlin, and Dresden. 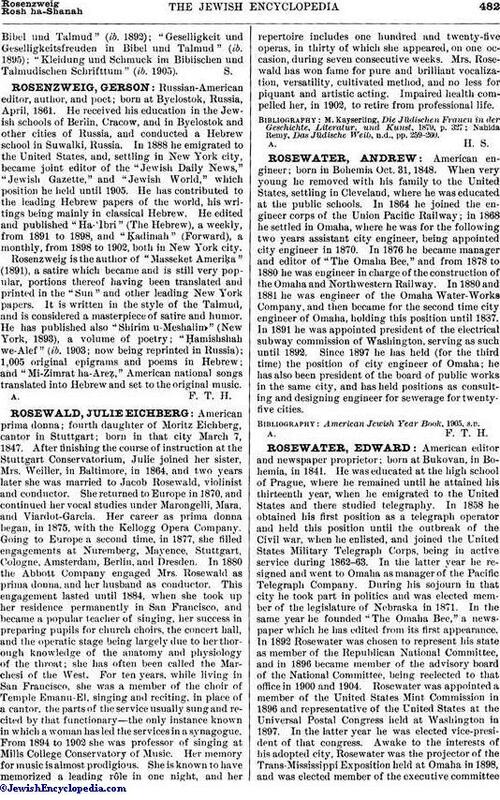 In 1880 the Abbott Company engaged Mrs. Rosewald as prima donna, and her husband as conductor. This engagement lasted until 1884, when she took up her residence permanently in San Francisco, and became a popular teacher of singing, her success in preparing pupils for church choirs, the concert hall, and the operatic stage being largely due to her thorough knowledge of the anatomy and physiology of the throat; she has often been called the Marchesi of the West. For ten years, while living in San Francisco, she was a member of the choir of Temple Emanu-El, singing and reciting, in place of a cantor, the parts of the service usually sung and recited by that functionary—the only instance known in which a woman has led the services in a synagogue. From 1894 to 1902 she was professor of singing at Mills College Conservatory of Music. Her memory for music is almost prodigious. She is known to have memorized a leading rôle in one night, and her repertoire includes one hundred and twenty-five operas, in thirty of which she appeared, on one occasion, during seven consecutive weeks. Mrs. Rose-wald has won fame for pure and brilliant vocalization, versatility, cultivated method, and no less for piquant and artistic acting. Impaired health compelled her, in 1902, to retire from professional life. Nahida Remy, Das Jüdische Weib, n.d., pp. 259-260.